The Divide (aka The Georgetown Divide) is the area that runs between the Middle Fork and the South Fork of the American River. Dissected by Highways 49 and 193, much of this area is within an easy drive from Highway 50 and Interstate 80. The Divide is the gateway to the vast Sierra Nevada's National Forest and Wilderness areas. The further east and higher in elevation you travel you see less and less private, deeded property. Almost everything is National Forest, so PRISTINE, PRIVATE, WILD AND UNTOUCHED PROPERTY FOR SALE is very rare in this area. Looking for a special place to call your own? A private, remote, special place for just you, your family?... A little piece of wilderness to share with those you love... or to go and just get away and disconnect...? Maybe a Northern Sierra Trout Fishing Property? How about owning a part of a Wild Native Trout Fishery? After driving just under an hour from downtown Placerville (including 20 minutes of dirt/gravel/rough road) you park, check your gear and take a hike. A private easement, along an old "Skid Trail" or "Skid Road" will lead you along whaler creek and to a nice gradual, solid gravel crossing... and then you start uphill, staying on the skid trail... about another 100-120 feet or so, where you will cross the southern boundary and enter the property. Here's a few maps of the area long with several other driving maps, directions and useful info about the journey to the property. There are very few level to semi level spots without big rocks outcroppings or trees. IF YOU INTEND TO TRY TO FIND THIS PLACE, MAKE SURE YOU TAKE SCREEN SHOTS OF THE MAPS AND DIRECTIONS TO SAVE IN YOUR PHOTO'S ON YOUR PHONE . CELL COVERAGE UP HERE THERE IS VERY LITTLE TO NONE; you will not be able to get a signal too access this page on your phone. Verizon, or not. Continue 1.2 miles to crossing at Whaler Creek and junction of private easement road/CAT trail that follows along whaler creek upstream to creek crossing. cross creek continue up trail - not for sure where the property line is but is seems to me 150-200 feet up road from creek. (property has never been surveyed). You can get to Swansboro Airport from Highway 193 at Rock creek Road or from Placerville by heading north out of town on Mosquito Road and following the signs. Just not advisable to have a trailer or large rig of any kind that way) Either way it is approx 1/2 hour to 40 minutes from downtown Placerville. HERE, THE ADDRESS IS IRRELEVANT ON MOSQUITO ROAD IN LOWER LEFT OF PICTURE- JUST FIND THE EAST END OF THE RUNWAY AND GO NORTHEAST ON ROCK CREEK ROAD. GO PAST LAKE AND PARK ON RIGHT, AND FOLLOW ROAD TO THE BANK OF MAILBOXES, WHERE YOU TAKE A HARD LEFT. THIS IS ROCK CREEK/ONE EYE CREEK ROAD, THAT BECOMES ROCK CREEK ROAD AGAIN. TOPO MAP OF ROAD FROM AIRPORT TO SLATE MOUNTAIN MINE ROAD--- TURN LEFT TO DOWNHILL AT ROAD #12N83 - (THERE IS USUALLY A WHITE CROSS IN THE FORK OF THE ROAD). THIS IS SLATE MOUNTAIN MINE RD. FROM THE FORK GO ABOUT 1.2 MILES TO THE FIRST MAJOR CREEK CROSSING- TWO LARGE 6 FT CULVERTS. THIS IS WHALER CREEK (MARKED WITH THE RED X ON MAP) AND THIS IS WHERE YOU START WALKING UP THE CREEK TO THE PROPERTY. From Swansboro Airport, take Rock Creek (Mosquito becomes Rock Creek at airport), go north past private lake on right, road drops down into trees, at rhe gig bank of mailboxes go hard left. Follow 4 miles, stay on pavement - then pavement becomes dirt - look for white cross at fs road 12N83 go left – follow to Whaler Creek crossing (2 big culverts). Old easement road (cat track) goes north on east side of Whaler Creek. Road crosses creek and property line starts about 50 feet from Whaler Creek easement road. Directions from Swansboro airport south east end of runway at Rock Creek/Mosquito Road intersection. North-East on Mosquito Road; go past pond on right. Go to next major intersection, turn hard left (at bank of mailboxes.) YOU ARE NOW ON ROCK CREEK ROAD EVEN THOUGH THERE IS NO SIGN. Continue 1.2 miles to crossing at Whaler Creek and junction of private easement road/CAT trail/double track that runs north and follows along whaler creek. Park somewhere here near creek and walk along skid trail upstream to creek crossing. Cross creek and continue up hill on skid trail - not for sure where the property line is but is seems by maps it's 250-300 feet up road from creek. (property has never been surveyed). There is a turn to the left, and then two "tiered" landings, or flattened areas, not sure it these are on property or not. This road/trail heads uphill and then runs right, crosses a stream bed (normally not wet year round) and then runs east along the hillside for approx. 200 yards then turns northward to the left and becomes very, very steep and rocky. Follow for 150-200 yards and this will take you to the northern boundary that is marked with national forest boundary signs. 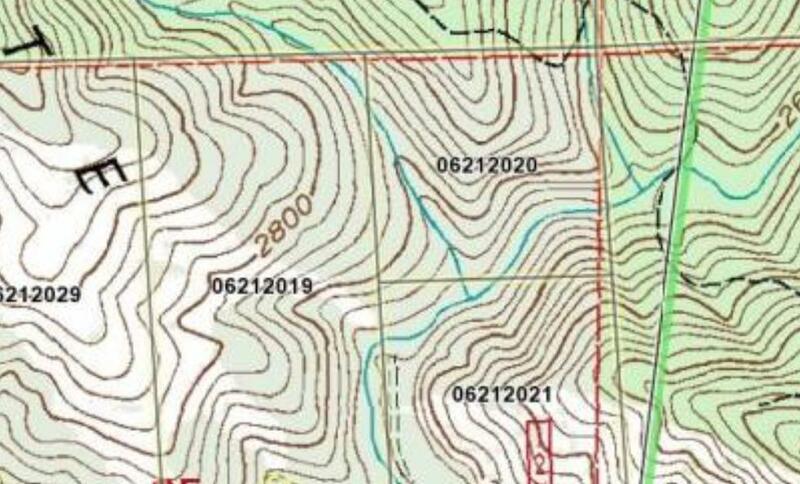 (the national forest boundaries have been surveyed in the 70's for a timber sale. those boundaries are marked. The east property line starts at the northeastern corner of the property. The corner is on the east side of Ballard Canyon, and is accessible by foot from the cat track/ two track road- turn to head downhill and then follow the first old logging trails or "Skid Trails" that meander and switchback toward the bottom of Ballarat Canyon. Almost all of these have had motorcycle traffic and the trails are easy to see and follow. There are few boundary signs on northern boundary in this section so do not get too far north before taking a switchback to head south again and lower into the canyon. Don't worry about if you are on the right trail or not, the lower you switchback down into the canyon all the trails converge and then basically run out as it gets too steep and the ground too loose for motorcycles. You'll have to just make your way. From the creek, it is relatively easy to make your way downstream (you pretty much HAVE to get wet and walk in the creek for some of the way) but it is just a short walk back to the Whaler Creek Canyon. As you turn right at the Whaler Creek and Ballarat Canyon Creek convergence, you are only 100 yards or so from Whaler Creek Falls in the video above and the pretty little clearing where there seems to be an old home site. Please call before you just head out though, and don't go alone. Except for the occasional motorcycle, I have never seen anyone or even found a fresh footprint in the 25 or so times I have been up there. Let someone know where your going and when you'll be back. Here's something fun: can you find whaler creek on this old map? Contact me today to see this awesome property. Or to see other beautiful fishing properties for sale in the Sierras! LET'S GET YOUR HOME SOLD!! DO YOU HAVE YOUR HOME READY TO GET TOP DOLLAR?